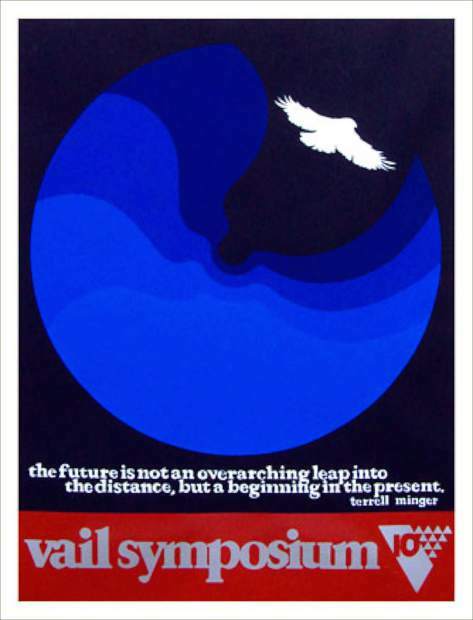 This poster, designed by artist Thomas Benton, was first shown during the 10th Vail Symposium in 1981. Benton used a quote by Terry Minger, an influential early town manager for Vail and a founder of the Vail Symposium, to commemorate the 10-year anniversary of the organization. What: Then, Now & Then Some Party, celebrating 45 years with the Vail Symposium. When: 7-10 p.m. Thursday, Dec. 8. Where: Donovan Pavilion, 1600 South Frontage Road W., Vail. More information: Tickets can be purchased online at www.vailsymposium.org or by calling 970-476-0954. VAIL — The Vail Symposium Board of Directors and staff collectively agreed that buying a motorcycle was no way to deal with the organization’s landmark midlife birthday. They’ll instead be throwing a party to celebrate 45 years of thought-leadership in the Vail Valley. With music from Vail’s own Rewind band, the Vail Symposium is inviting the community out for a night of food, drink, dancing and celebrating the score of individuals who have come together under the banner of the Symposium in the past 45 years. The party is being called Then, Now & Then Some and will be held on Thursday, Dec. 8, from 7 to 10 p.m. at Donavan Pavilion in Vail. The night will include a toast and displays of the Symposium’s rich history, including rare prints of early iconic Vail Symposium posters created by artist Thomas Benton. From the organization’s inception in 1971 to where it stands today, the Vail Symposium remains an integral part of the intellectual truths that have guided a once-small mountain town to become a world beacon for healthy living, tolerance, self-discovery, curiosity and informed decision making through education. The organization has presented Pulitzer Prize-winners, artists, authors, politicians, scientists, social reformers, celebrities, adventurers and diverse storytellers. The list of speakers, in addition to Ford and Robinson, includes names such as Ayaan Hirsi Ali, Christo, Gary Hart, Tom Brokaw, John White, Bud Palmer, Barney Frank, Cecil Andrus, Steph Davis and many more. While the Symposium party looks back in celebration, it also looks forward to a future of serving the community as its shepherd of pertinent information.